Bet on the horses, tailor a suit or cast a curse on your boss. 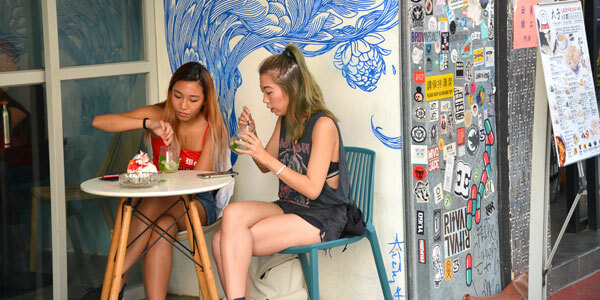 Street art cafes dot Sham Shui Po, Hong Kong’s oldest district, now enjoying a huge resurgence with visitors and locals alike in search of Sixties’ nostalgia. Hong Kong has always been much more than a business hub. You don’t have to be on a Goldman Sachs expense account to get the best out of it. Much of the appeal comes from its multi-sensory energy and ever changing personality. Every street corner struggles for its own piece of the action that in turn defines the montage. Shifty street-side astrologers vie with gleaming multi-storey malls, and frantic cut-price electronic stores compete with gorgeous quiet beaches and hiking trails in the sparsely populated outlying islands and the New Territories. Chek Lap Kok, is large, airy and very 21st century. Designed by prolific British architect Sir Norman Foster, it’s a remarkable piece of design. Situated on an islet just off Lantau Island, it connects to Kowloon and Hong Kong Island by bridge and snaking highways. Also to distract you a smidgen, is the large Sky Plaza mall. Taxis in Hong Kong are inexpensive, safe and reliable. Drivers’ English skills are patchy, but your concierge or even a passer-by can help with any difficulties. Few travellers consider renting cars, since parking spaces are such a pain to find, and expensive. Pay at entry when you get on a bus. Fares are clearly marked on money boxes. Buses are a convenient way to get around, when it’s not rush hour. Try the double-decker Number 6 bus from Central to Stanley or Number 15 from Central up to The Peak. For an introduction to the real Hong Kong there really is no better way than to trundle the length of the tram line, which runs along the northern edge of Hong Kong Island. Sit up top, at the front if you can, for the best view. It’ll take you an hour or two, but there’ll be little you haven’t seen by the end of it. Now, on with our Hong Kong guide.